Scania Omicity? Would someone ever make this? I would also like to see if people would like to have one aswell. So would you? I haven't actually found any thing of a right hand drive for a left hand map of a Scania Omicity. If there is please tell me! 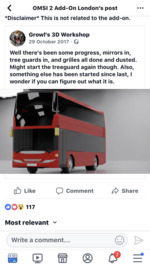 If I ever get to a stage where I feel I can model OMSI buses to a good quality, I'd probably like to start with the Scania range so I can re-use parts of the model. Start with an Omnidekka, chop the top deck off and shorten for an Omnitown, stretch and rearrange windows for an Omnicity and then make taller for an Omnilink. Stretch again for the tri-axle version! Someone will one day. I pray for the day. Their engines are awesome, especially with the cooling fans active at full force. Tons of them are around my area with the fans revved up. It'll be awesome to one day be able to simulate that on OMSI. Just got to be patient and hope someone willing comes forward. I was really requesting it, I just wanted to know if anybody knew if there was one and if there is one in the progress of development. I'm truly sorry if I sent out the wrong message. I hope you do! Anyways I hope you can keep learning everyday. Create anything you want. No Sorry, I did mean the put credit in however haven't got round to doing it. I’m still praying for a high quality Optare Solo to be made I know that v3d was making one but I dunno if he is still modelling? All well with the amount of good quality Modlers there’s bound to be good buses! I can't remember where I found this, but would you be looking for something like this?